Don't eat that apple! But you can eat the yummy sweets inside. 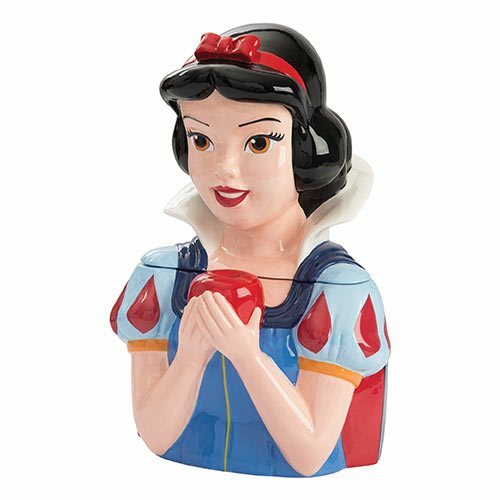 This beautiful and functional Snow White Sculpted Ceramic Cookie Jar features a unique custom-sculpted design, a silicon freshness seal, and exquisite hand-painted details. It measures approximately 13 3/4-inches tall and comes in a full-color gift box. They're not just for cookies anymore! These beautiful and uniquely crafted cookie jars can be used to hold a variety of household items, for kitchen to home organization to a fan's favorite conversation starter. Hand wash only. Not dishwasher safe.